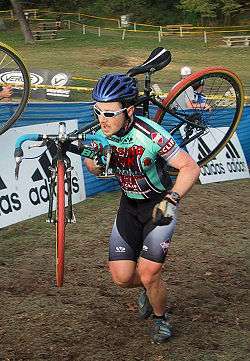 A cyclo-cross racer carrying his bicycle up a steep slope. Cyclo-cross (sometimes cyclocross, CX, cyclo-X or 'cross) is a form of bicycle racing. Races typically take place in the autumn and winter (the international or "World Cup" season is October–February), and consist of many laps of a short (2.5–3.5 km or 1.5–2 mile) course featuring pavement, wooded trails, grass, steep hills and obstacles requiring the rider to quickly dismount, carry the bike while navigating the obstruction and remount. Races for senior categories are generally between 30 minutes and an hour long, with the distance varying depending on the ground conditions. The sport is strongest in the traditional road cycling countries such as Belgium (Flanders in particular), France and the Netherlands. Cyclo-cross has some obvious parallels with mountain bike racing, cross-country cycling and criterium racing. Many of the best cyclo-cross riders cross train in other cycling disciplines; however, cyclo-cross has reached such size and popularity that some racers are specialists, and many prioritize cyclo-cross races over other disciplines. Cyclo-cross bicycles are similar to road racing bicycles: lightweight, with somewhat narrow tires and drop handlebars. They are typically differentiated by their greater tire clearances, lower gearing, stronger frames, cantilever brakes or disc brakes and more upright riding position. They also share characteristics with mountain bicycles in that they utilize knobby tread tires for traction and, increasingly, disc brakes. They have to be lightweight because competitors need to carry their bicycle to overcome barriers or slopes too steep to climb in the saddle. The sight of competitors struggling up a muddy slope with bicycles on their shoulders is the classic image of the sport, although unridable sections are generally a very small fraction of the race distance. Compared with other forms of cycle racing, tactics are fairly straightforward, and the emphasis is on the rider's aerobic endurance and bike-handling skills. Drafting, where cyclists form a line with the lead cyclist pedaling harder while reducing the wind resistance for other riders, is of much less importance than in road racing where average speeds are much higher than in cyclo-cross. A cyclo-cross rider is allowed to change bicycles and receive mechanical assistance during a race. While the rider is on the course gumming up one bicycle with mud, his or her pit crew can work quickly to clean, repair and oil the spares. Having a mechanic in the "pits" is more common for professional cyclo-cross racers. The average cyclo-cross racer might have a family member or friend holding their spare bike. There are many stories about the origins of cyclo-cross. One is that European road racers in the early 1900s would race each other to the next town over from them and that they were allowed to cut through farmers' fields or over fences, or take any other shortcuts, in order to make it to the next town first. This was sometimes called steeple chase as the only visible landmark in the next town was often the steeple. This was a way for them to stay in shape during the winter months and put a twist on road racing. In addition, riding off road in more difficult conditions than smooth pavement increased the intensity at which the cyclists were riding and improved their on-the-road bike handling abilities. Forced running sections, or portage, were incorporated to help deliver warm blood to the feet and toes, as well as exercise other groups of muscles. Daniel Gousseau of France is credited as having inspired the first cyclo-cross races and organized the first French National Championship in 1902. Géo Lefèvre, the originator of the idea for the Tour de France, also played a key role in the early days of the sport. After Octave Lapize attributed his win in the 1910 Tour de France to his off season training in cyclo-cross the sport began to spread to countries bordering France. Belgium organized its first National Championship in 1910, Switzerland did so in 1912, then Luxembourg in 1923, Spain in 1929 and Italy in 1930. Cyclo-cross proved itself as a sport extending beyond the boundaries of France when in 1924 the first international race, Le Critérium International de Cross-Country Cyclo-Pédestre, was held in Paris. Like many international cycle sports, cyclo-cross is administered by the Union Cycliste Internationale; although it wasn't until the 1940s, around 40 years after cyclo-cross' inception, that the UCI began its regulation and the first world championship was held in Paris in 1950. The first United States Cyclo-cross National Championships took place on October 20, 1963 in Palo Park, IL, near Chicago. These championships in the midwest continued until 1969. Cyclo-cross began to become popular in the United States in the 1970s, in New England and California. The Cyclo-cross National Championships restarted in 1975 in Berkeley, CA and have continued to be held every year at various locations throughout the United States. The Surf City race series held in Santa Cruz, CA has contributed to the history of cyclo-cross in the United States. The sport has experienced a growth in popularity in the United States since the mid 1990s. 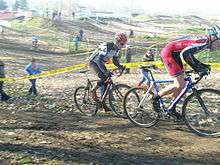 Cyclo-cross races are now regularly held in the fall and winter seasons throughout the United States and continue to grow in popularity. Cyclocross is typically an autumn and winter sport, the northern hemisphere season running from September to February. The World Championships take place in late January. The Canada and US national championships are held in November and January, with little racing after that except in the climates of the Southern and Western United States like California. Riders' age categories for cyclocross under UCI rules are currently determined by their age on 1 January which lies in the middle of the international season, i.e. they compete in the same category that they would be in for the following road season. Cyclo-cross bicycles generally resemble road racing bicycles. Cyclo-cross-specific frames differ with their wider tire clearances, knobby tires, cantilever or disc brakes, and lower gearing. Cables are generally routed on the upper side of the top tube, which allows the rider to carry the bike comfortably on the right shoulder through portage sections, and prevents cable contamination by dirt. Popular on many cyclocross bikes is routing the brakes so that the right brake is often the front brake. This is done to allow the left hand to control speed while approaching obstacles requiring the bike to be carried, while the right hand grips the frame ready to lift the bike onto the shoulder as soon as the rider`s feet touch the ground. As a high-end bicycle purpose-built for a specific sport competition, they also differ from ordinary cross bikes, which are general-purpose utility bikes fitted with slightly wider 700C tires for use on unpaved paths or trails. Cyclo-cross bike design and frame geometry has evolved over the years. The first cyclo-cross bikes were touring-type road bikes, used for their cantilever bosses, slacker angles and wider tire clearance. Over time as the sport became more formalized, frame angles changed for quicker handling and bottom brackets heights were raised to clear broken ground. Most cyclo-cross frames have a non-compact (flat or near-flat top tube) frame design for easier shouldering. Some design features have recently begun to change, for example, a heightened bottom bracket was typical 10+ years ago; now many cyclo-cross-specific frames do not have elevated bottom brackets, in fact many have a lower bottom bracket than road racing bicycles; this is favorable since the lower seat height makes for easier remounting, and a lower center of gravity increases stability. Many cyclo-cross bicycles are now set up with a single chainring and chain "drop" guards. A single chainring setup simplifies mechanics and reduces the chance of the chain derailing on a bumpy course. People who do run a double chain-ring set up on their bicycles generally use a 36-46 gearing. Many professional-level cyclo-cross bikes are set up with deep-section carbon tubular wheels, not for the purpose of aerodynamics, but to keep the wheel from being entrapped in deep sand or mud sections. Tubular tires are used to avoid pinch flats, decrease rolling resistance and increase grip with lower tire pressures. In addition, single speed cyclo-cross bikes are becoming increasingly popular for a variety of reasons, including lower initial cost of setup, ease of use and maintenance, and decreased likelihood of mechanical failure on the course. Clothing is similar to that of road racing. However, since cyclo-cross is a cold-weather sport there is an emphasis toward warmer clothing such as long sleeves, tights, knickers and arm and leg warmers. While many racers will use standard two-piece road kits, there is a very strong preference to wear one piece skinsuits to maximize freedom of movement. The other advantage of skinsuits is that they are tighter, preventing the jersey from getting caught on stray tree branches during some singletrack sections of the race course. The one piece construction of the skinsuit also prevents it from exposing the torso while the rider shoulders the bike. Mountain bike shoes are adopted, as they allow the competitors to run, unlike their road racing counterparts, and due to their degree of traction (compared to smooth bottoms found on road racing shoes). Toe spikes are used to aid in running up steep muddy slopes and in the adverse underfoot conditions. Full-finger gloves are optional but generally recommended for hand protection and for grip in muddy/wet situations. Experienced riders racing in dry conditions will often eschew gloves, presumably for better tractional feedback though the handlebar, and more natural bike portage. Races usually consist of many laps over a short course, ending when a time limit is reached rather than after a specific number of laps or certain distance; the typical length for senior events is one hour, with 30 and 45 minute races for lower categories being the norm. Generally each lap is around 2.5-3.5 km and is 90% rideable. Races run under UCI rules must have courses that are always at least 3 m wide to encourage passing at any opportunity, however sections of singletrack are common for small races in the USA and Great Britain. A variety of terrain is typical, ranging from roads to paths with short steep climbs, off camber sections, lots of corners and, a defining feature, sections where the rider may need, or would be best advised to dismount and run while carrying the bike. Under-tire conditions include asphalt, hardpack dirt, grass, mud and sand. In comparison to cross-country mountain bike events, terrain is smoother. Less emphasis is put on negotiating rough or even rocky ground with more stress on increased speed and negotiating different types of technical challenges. Each section of the course typically lasts no longer than a handful of seconds. For example long climbs are avoided in favour of short, sharp inclines. Sections are generally linked together, or long straights broken up, with tight corners. This not only allows a standard length course to fit in a relatively small area, but also forces competitors to constantly change speed and effort. Accelerating out of corners, then having to decelerate for the next before accelerating again is a common theme. Obstacles that force a rider to dismount and run with their bike or to "bunny hop" include banks too steep to ride up, steps, sand pits and plank barriers. Besides the start/finish area, these obstacles may be placed anywhere on the course that the race director desires. Several race directors have tried to limit bunny hopping for safety reasons by placing barriers in pairs or in triple (although under UCI rule no more than two barriers can appear in succession), however this hasn't stopped some of the best bunny-hoppers from getting over them. The regulation height for a barrier is 40 cm although this is treated as a maximum at smaller events. Plank barriers seem to be more common in the US than in Europe and UCI regulations only permit one section of them on the course. Since outside assistance is allowed, pits are included to provide a consistent area for this to occur. A pit to the right of the course is normal since most riders dismount to their left. In larger events a separate pit lane is featured so only those wishing a new bike or other assistance need enter the lane (this type was debuted at the Zeddam, Netherlands World Cup of January 1999). In some cases pits are provided in two different parts of the course. Long-format races, in which riders compete cross country also exist. Examples include the Three Peaks Cyclo-Cross, a 61 km race, Barry-Roubaix, and the American UltraCX Championship Series which consists of seven stages ranging from 80 to 115 km. Although cyclo-cross courses are less technical than those of mountain biking, each particular obstacle requires specific technical abilities of competitors. For example, dirt single-track and streams (like in mountain biking) are also sometimes integrated into the course, depending on the location, both of which require rider experience and technique. Some course sections are extremely muddy, wet or even snowy in the winter, and others are dusty and sandy. Most of these conditions are usually considered too extreme to be ridden with the standard 32c tire, and so much of the challenge of cyclo-cross lies in maintaining traction through loose or slippery terrain at speed. The power of the rider is generally higher over the whole duration of a 'cross race to overcome greater amounts of rolling resistance from loose dirt or grass. Also common are steps, barriers, ditches, stairs, steep slopes and very deep mud or sand which all require running while carrying the bicycle. As a result, cyclocross is also known as the "steeplechase of cycling." This approach was invented by Octave Lapize and proven by Eugène Christophe who in 1913 had to carry his broken bike down the Tourmalet during the Tour de France. Although getting off and on a bike sounds simple, doing so in the middle of a quick-paced race is difficult. Being able to fluidly dismount at speed, pick up and carry the bike, then put it back down and remount smoothly without losing momentum requires practice and skill, as the competitor may do this dozens of times every race. A faulty or slow dismount/remount may cost valuable seconds, waste energy or cause the competitor to crash. Often, when sections are extremely technical or become impossible to ride due to erosion from repeated wear or inclement weather, the racer will carry the bike and jog for an extended time to save energy. A more recent development to overcome obstacles such as barriers and sometimes ditches is the bunnyhop, which came to prominence in 1989 when Danny De Bie used it in his successful World Championship run. Bunny hopping has become less popular as a result of race directors seeking to limit its use by setting up two or three barriers in a row. Skilled riders are still able to hop the obstacles, despite the back to back to back barriers. Sven Nys, an ex-BMX racer, demonstrates the importance of technical skills as he continues to dominate the sport. ↑ Cyclocross: History & What You Should Know Konrad, Gabe: "Cyclocross: History & What You Should Know". Bicycle Trader Magazine, 1996. Retrieved May 15th, 2012. 1 2 3 books.google.com Herlihy, David V. "Bicycle: The History", page 397. Yale University Press, 2004. ↑ cvccbike.com Schwartz, Bob. The 1963 US Cyclocross National Championships. ↑ books.google.com Burke, Edmund R. & Pavelka, Ed: "The Complete Book of Long Distance Cycling", Page 254. Rodale, 2000. ↑ "COURSE DETAILS - 3 PEAKS CYCLO-CROSS". Retrieved 9 April 2013. ↑ "Races". American UltraCX. Retrieved 9 April 2013. ↑ Cary, Tom (11 May 2014). "Women's Tour 2014: Marianne Vos a worthy winner as cycling enjoys a breakthrough moment". The Daily Telegraph. UK. Retrieved 14 Jan 2015. ↑ Brady, Patrick (1 May 2011). The No-Drop Zone: Everything you need to know about the peloton, your gear, and riding strong. Menasha Ridge Press. p. 61. ISBN 978-0897326605. ↑ Bray, Tonya (17 Oct 2011). "Caroline Mani and Ryan Trebon win day 2 at the Spooky Cross". velonews. USA. Retrieved 14 Jan 2015. Wikimedia Commons has media related to Cyclocross. Cyclocross Magazine is a print magazine, website and online community dedicated cyclocross news, race coverage, products, and culture. Plus One Lap cyclo-cross info/FAQ/ - Cyclocross Bike Gallery of lightweight and custom bikes. "Cyclo-cross Organiser's Workbook". British Cycling.